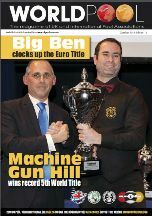 With a record number of 360 entries plus highest prize fund yet of 16,500 euro, the 2014 European 8-Ball Pool Championships hosted by Malta has gone down as the “best” European event ever staged. The only down side for the hosts and organising committee was the disappointment of missing a title as reward for all their hard work. But while England claimed most of the team honours, Maltese players featured in a highly credible five finals; losing three of them by a deciding frame only. Players from French speaking, Reunion Island, who delighted tournament bosses with a first ever appearance at last season’s WEPF World Championships, returned to their European roots as guests. And they didn’t turn up just to swell the numbers as they became the first ever men’s C team champions. The Reunion contingent and fellow invitees, Morocco , helped add a new dimension to the Championships. Bristol’s Ben Flack claimed the men’s individual title with Northern Ireland cue queen, Emma Cunningham, adding the ladies equivalent to her world title at Barbara Taylor’s expense. Golden oldie Keith Brewer added the European Seniors crown to his European win in the main men's singles of 2013. Irish youngster Jamie Gaffney became the new European Junior champion whilst Channel Islander, Ryan Shaw, won his first major title defeating England star Giuseppe D’Imperio in the deciding frame of the Under 21 event. Away from the action, Vincent Degiorgio and his brilliant Malta committee, produced a tournament to remember. From the opening ceremony with its fantastic laser display, through a week of outstanding competitive pool, until the spectacular closing ceremony with dancers and champions’ reception, the week was an outstanding and enjoyable time for all in attendance. The championships were also “streamed” live and resulted in more than 25,000 hits during the competition as well as the hundreds of fans who flocked to the Dolmen Resort Hotel.